Last week, we took a look at the most popular all-natural, calorie-free sweetener, stevia. This one can be found just about everywhere and has gained a lot of popularity over the past few years. 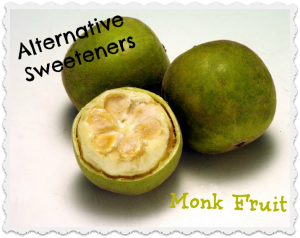 Today, we’re going to talk about a newcomer to the all-natural sweetener scene, monk fruit. Well, like the name says, it is a fruit. The monk fruit grows on vines and is cultivated in China where it is considered a national treasure and has never been genetically modified. This little fruit looks a bit like a large, round lime on the outside and has a soft fleshy fruit inside with many large seeds. Scientists isolated the “sweetness” of monk fruit and attribute it to the compound “mogroside V” which is found in the fruit and the rind. The sweetness of different varieties and harvests of monk fruit will vary, but the mogroside V level is used to test the overall sweetness of a batch. The dried juice of the monk fruit is estimated to be 200-300 times sweeter than sucrose (sugar). For well over 100 years, monk fruit has been used in China and throughout Asia for treating diabetes and obesity. Why? Despite its powerful sweetness, monk fruit extract has zero calories and no effect on blood sugar levels. In addition, the monk fruit has shown pretty hefty antioxidant and anti-cancer potential. It’s also been used to reduce inflammation, prevent tooth decay, and as an antihistamine. Ok, monk fruit. You sound too good to be true. Is there a catch? How Is Monk Fruit Processed? Pure monk fruit extract is very sweet but has a mild (or not so mild, depending on your palate) aftertaste. So, naturally, Procter and Gamble decided that monk fruit extract needed to be refined to remove the “interfering aromas”. After a complex extraction process featuring solvents and resins, a “better-tasting” monk fruit extract is produced. These two processing methods could not be more different. One is simple and pure; the other is complex and chemical-laden. My question is: how do I know which type of monk fruit I’m buying?? The answer: research your source. I found that one manufacturer of monk fruit in particular uses a patented refining process: “BioVittoria’s monk fruit products are supplied under licence obtained from Proctor and Gamble.” However, as I tried to find a clean-cut definition of which brands used BioVittoria’s monk fruit extract, I had very little luck. I’ve emailed a few companies to ask about their refining process and monk fruit extract sources, but I don’t have any good info to share yet. If a squeaky-clean extraction process is important to you, I’d hold off on using monk fruit until this is clarified. Disclaimer: monk fruit is a food. If you have any fruit allergies, there is a small chance you may have a sensitivity to monk fruit. Monk fruit allergies typically manifest as a rash or hives. Talk to your doctor if you are a concerned. …most of the commercial monk fruit sweeteners aren’t selling pure monk fruit extract. What are we being sold? (If you’ve been following the artificial sweetener series, you probably already know the answer.) Fillers, other forms of sugar, GMO products, and even plain sugar. There are two big players in the monk fruit game right now: Nectresse and Monk Fruit in the Raw. (Nectresse will send you a free sample, if you want to try it out. In the Raw isn’t volunteering free samples, but they do have some coupons for you.) As with all the other sweeteners that are 200+ times sweeter than sugar, the manufacturers have added bulking agents to help consumers with the conversion from sugar. Personally, I hate paying for bulking agents. I also have issues with what bulking agents are: usually another form of sugar with an equally high glycemic index. To me, that completely negates the benefit of using an alternative sweetener! I wasn’t very impressed with these two options. (If I wanted to use sugar and molasses, I’d just use sugar!) If monk fruit is really that great of a sweetener, shouldn’t there be more options? I did find one other option, which I am actually going to try out myself. Lakanto is produced by the Saraya company. It contains just two ingredients: erythritol and monk fruit extract. Under normal circumstances, I wouldn’t go for erythritol, because it’s derived from corn. However, I was happy to see that Lakanto’s erythritol is sourced from certified non-GMO corn, which makes me feel a little better about it. Also, out of all the sugar alcohols out there, erythritol is the only made from a fermented source and does not have…um…”distressing effects”…on your digestive system. Since my mother is diabetic, I like to have a zero-calorie sweetener on hand, and this one may work out well. I haven’t seen Lakanto in the stores, but I did find it on Amazon (about $12 for 8 oz). There is a lot of talk these days about using monk fruit extract to sweeten school lunch chocolate milks. This would let kids keep their chocolate milk but slash the sugar consumption. How would you feel about this change? The goal of using a natural, alternative sweetener is to cut calories but still enjoy something sweet that won’t spike your blood sugar. Monk fruit looks like it may actually be good for you. However, think before you buy. Inspect the ingredients list for maltodextrin, sugar, molasses, and more. None of these additives will help you cut calories or control blood sugar levels, and, in my opinion, negate the benefits of using an alternative sweetener. If you’re truly wanting a 100% all natural option, this may not be what you’re looking for. There is still a good bit of processing and enhancing that goes along with monk fruit sweeteners right now. I’ll be keeping my eye on the monk fruit industry, because I feel like there is a lot of potential for a good product down the road. We will begin wrapping up our alternative sweetener series and discuss sugar alternatives with calories! We’ll be taking a closer look at agave, coconut sugar, and the sugar alcohols (xylitol, erythritol). How do these options compare to regular sugar, do they have any benefits, any drawbacks, and what’s worth the additional cost?